Honeywell AlarmNet's 7847i Internet Communication Module was developed to transport alarm signals via the Internet or Private LAN (7847i-E only). These easy-to-install devices provide sophisticated data security and communicate with the GEOARM central station through the AlarmNet server. In addition to alarm reporting, the 7847i provides upload/downloading capability via the internet or a Private LAN (7847i-E only). The Honeywell 7847i is an AlarmNet broadband internet alarm monitoring communicator that is compatible with Honeywell's VISTA Series security systems. The 7847i is backed by Honeywell's AlarmNet division, which has been providing advanced alternative alarm communication paths since 1986. AlarmNet is the one of the most advanced and dependable alarm communication provider in the industry. All AlarmNet communicators are supervised by AlarmNets' Network Control Center which is essentially a set of servers that periodically checks connectivity to each AlarmNet alarm communicators. The control center and also forwards all alarm signals to GEOARM's central station for alarm monitoring. Before cellular phones or the internet, just as every family relied on a traditional landline telephones for their alarm communications, security systems also relied on this telephone connection. In today's advanced technological age, telephones are becoming extinct as they are being rapidly replaced by cellular phones and internet based technology. Unfortunately during the transition from landline telephones to wireless cellular phones, many security system owners were forced to continue paying for telephone service they did not want or need. Now however, through Honeywell's AlarmNet division, GEOARM offers those very same security system owner an option for finally cutting ties with their home telephone and hefty bill. With an Honeywell internet alarm communicator like the 7847i, you can save money by eliminating your telephone bill, and still enjoy the safety that comes along with central station alarm monitoring service from GEOARM. The Honeywell 7847i connects to your Honeywell VISTA Series security system with a simple 4-wire connection and replaces the need for an active telephone connection. Once the 7847i is installed, you simply connect an Ethernet wire from an open port on your home network's router or switch to the RJ45 Ethernet connector on the 7847i. 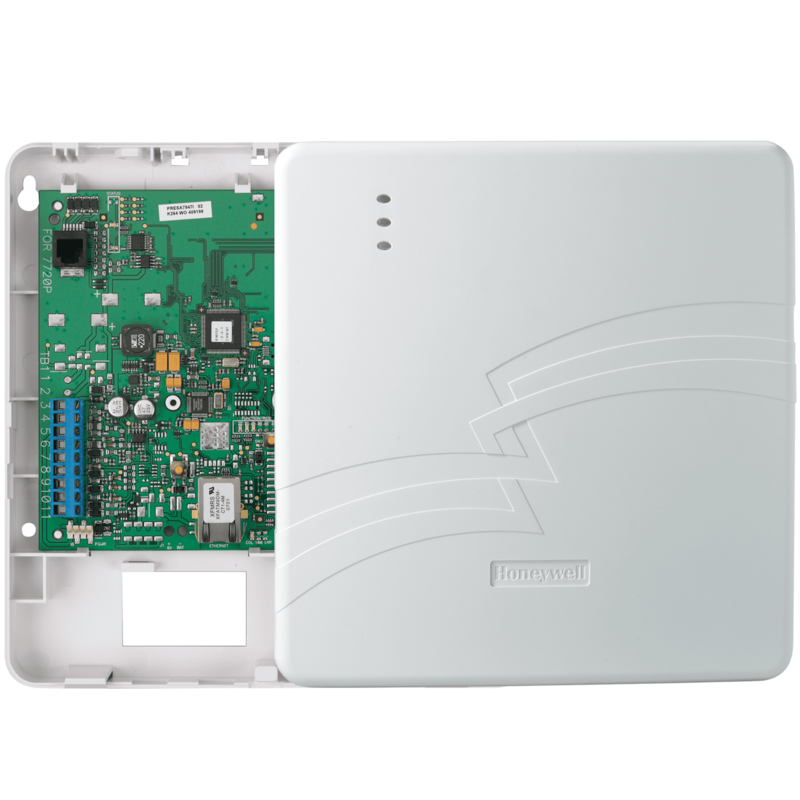 The 7847i internet alarm monitoring communicator will then transmit all of your Honeywell security system's alarm signals to GEOARM's central station using your broadband internet connection. The internet alarm communicator uses minimal bandwidth so you never have to worry about it affecting your normal internet service. The 7847i will send 300 bytes of data every (20) seconds for the MAC ping to AlarmNet, 1 kb of data for every alarm signal and 600 bytes of data for every supervision signal sent to AlarmNet. AlarmNet also designed the 7847i to be network friendly so that it will connect easily to most home networks without any advanced network setup. If you do have a more advanced network setup, the 7847i is programmable to match your network. However, we recommend that you consult with your network administrator during installations with advanced networks. As the Honeywell 7847i relies on your home network, the internet alarm communicator is only as reliable as your broadband internet service. We recommend installing an uninterruptible power supply (UPS) or battery backup for your modem and router so that your internet service will not go down during a normal power outage. Without a UPS installed, your security system will still work during a power outage, as it has its own battery backup, but when the 7847i sends the alarm signal out it will fail as there is no internet available. Also, if you ever experience outages from your internet service provider (ISP), your alarm communications will not work during these outages. As the Honeywell 7847i is supervised by AlarmNet Control Center, GEOARM's central station will be able to alert you whenever your internet communication path is down. However, you may want to consider the AlarmNet iGSMV4G instead as it has a backup cellular 4G alarm communicator for those times when the internet path fails. The 7847i internet alarm communicator is also compatible with AlarmNet's Total Connect 2.0 service. If you sign up for the optional Total Connect 2.0 service, you will be able to remotely control your Honeywell security system from any web browser or iPhone®, iPad®, Blackberry® or Android™ device. If your Honeywell security system is older and not compatible with the newer Total Connect 2.0 service, you can also sign up for the original Total Connect 1.0 service. Honeywell internet security systems are extremely versatile and secure! The ability to install a system and have it send signals over the inexpensive broadband internet network is a wonderful thing. Whether you have a vacation home, remote warehouse or just simply do not have phone line or an expensive cellular communicator to be protected. If you are interested in broadband internet monitoring plans please check out our professional and Total Connect DIY alarm monitoring services. Feel free to reach out to us at sales@geoarm.com or 877-443-6276 with any further questions. -Reports signals via Internet or Intranet (7847i-E only). -Uses 256-bit Advanced Encryption Standard or optional 1,024 bit encryption with two-way authentication and no key exchange for maximum data protection. -Compatible with Dialer Capture Intelligence Device (non-ecp capable LYNX) or DCID-EXT (other control panels). Captures Contact ID messages from the panels' phone line and sends them to the central station via the IP communicator. -Flexible modes of operation allow ECP full alarm reporting by Honeywell control panels, 4204 relay mode for Honeywell controls that do not support ECP alarm reporting and zone triggering for use with other control panels. -ECP mode with compatible Honeywell control panels support full Contact ID reporting. All other modes use ADEMCO High Speed reporting format. -Each zone can be configured for +V, -V, or EOLR triggering. Each zone can be programmed for inverted operation, delayed reporting and restoral reporting. Zone 1 can distinguish between pulsed and steady inputs (7847i/7847i-E). -Built-in tamper sends a report when a tamper condition is detected and a restore when cleared. -Control Honeywell control panels via Internet or mobile device and e-mail notification of system events. * Requires optional Honeywell Total Connect service. -Easy CAT-5 10 BaseT connection to a hub or router-Quick connection to compatible Honeywell series control panels. -Simple programming using a 7720P programmer or AlarmNet Direct website. -With select Honeywell control panels. Requires Compass version 1.5.8.54a or higher. I purchased this unit with the full expectation that I would be able to install this myself. Not only was I able to do that, but with the help of Geo arm, I was also able to configure my system for use through the Phone App!